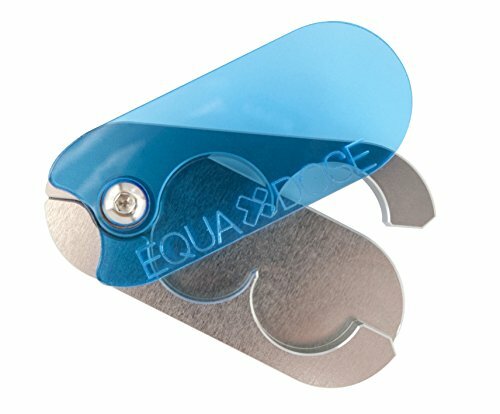 Equadose is a revolutionary new pill splitter that solves many of the issues with traditional, plastic, single-blade tablet cutters; and it works with just about every size and shape tablet. The design utilizes two opposing blades that come in from the sides to effectively score the pill prior to splitting. No more unequal halves, dangerous powder, or wasted medication. The patent pending blades are angled in such a way that they are not sharp to the touch, yet they will never dull. When not in use Equadose acts as a pill box with two compartments for pill storage and organization. As a pill case the swivel lid keeps medication safe in your pocket, but is easy to open for use. Currently selling in sapphire blue. We proudly craft every one of our splitters right here in the USA out of the finest aerospace grade aluminum. No expense is spared to make this the best pill splitter money can buy. In fact, we guarantee it for life! Please note that tablets are centered by eye with the Equadose. If you have poor eyesight or dexterity, this may not be the tablet cutter for you. PATENT PENDING BLADES: Our blades are angled so that they will never dull, yet they are not sharp to the touch. TWIN BLADES: The double blades create a split point that gives you perfect halves every time! COMPREHENSIVE DESIGN: This perfect pill cutter splits any size and shape tablet. QUALITY CRAFTSMANSHIP: Made of solid aircraft aluminum. Crafted here in the USA. GUARANTEE: We offer a Lifetime guarantee on the Equadose pill splitter! If you have any questions about this product by Equadose, contact us by completing and submitting the form below. If you are looking for a specif part number, please include it with your message. Multiple Pill Splitter. Original Patented Design, with Accurate Pill Alignment, Sturdy Cutting Blade and Blade Guard, for Splitting and Quartering Round or Oblong Pills.US Patent No. 9,827,165.